Celebrate the accomplished work of over 100 juried artists and artisans in our sun filled brick gallery and urban garden. With world famous restaurants and artisanal food just blocks away in our Gourmet Ghetto, feast all of your senses and visit our exhibitions and our gift gallery liberally filled with an ever-changing array of dynamic artwork. The Gallery will be on your left at the corner of Shattuck and Lincoln. Head North for on Shattuck Ave. for 7 block to 1652 Shattuck Avenue (at Lincoln). Arts & Crafts Cooperative, Inc. (ACCI), located in the heart of North Berkeley's Gourmet Ghetto, is a member-based community of artisans, artists, and art patrons. Initially conceived by a small group of artists and craftspeople in the mid-1950s, ACCI Gallery was incorporated in 1959 and moved to its current location in 1960. 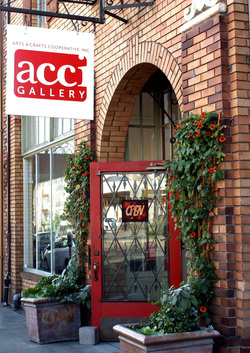 ACCI purchased the beautiful brick building which houses the gallery in 1976. As the oldest Arts and Crafts co-op west of the Mississippi, ACCI is celebrating its 60th year of operation in 2019! The mission of ACCI Gallery is to provide a showcase for emerging and established artists to display and sell their artwork, while building community among artists, members, and patrons alike. Approximately one hundred artists exhibit their various media, including ceramics, glass, jewelry, mixed media, painting, photography, printmaking, textiles, and sculpture. It is the mission of these artists to promote ACCI as a locally and nationally recognized model cooperative that presents a thriving retail outlet and exhibit venue for distinctive arts and crafts while providing a source of income support to its artists and an excellent working environment for its employees, all within a mutually supportive community.